Kenya's President Mwai Kibaki has set on fire nearly five tonnes of ivory worth $16m (£9.9m) to curb poaching. Mr Kibaki said the burning - only the third of its kind in Africa - showed the continent's determination to fight "criminal networks". The ivory was seized in Singapore and sent to Kenya where DNA tests showed it came from Malawi and Tanzania. The countries agreed earlier this year to jointly stop the trade, which conservationists say is increasing. At a ceremony in the Munyani region of eastern Kenya, Mr Kibaki used a long stick with a ball of fuel-doused cloth at the end to light the tall pyre of tusks. 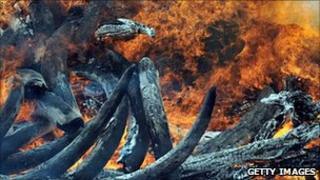 Some 335 tusks and more than 40,000 ivory carvings went up in smoke. "We cannot afford to sit back and allow criminal networks to destroy our common future," Mr Kibaki said. "Through the burning of contraband ivory, therefore, we are sending a clear message to poachers and illegal traders in wildlife about our collective resolve to fight this crime in our region and beyond." The BBC's Wazir Khamsin in Munyani says the ivory that went up in flames on Wednesday represents only 10% of Kenya's stockpile. The destruction of the ivory stockpile followed an agreement in May by Malawi, Tanzania and Kenya to strengthen law enforcement efforts to end wildlife smuggling. The burning was the first involving the three countries, after Singapore agreed to return the stockpile nearly 10 years after it was seized. In 1989, Kenya burnt its own stockpile of seized ivory, while Zambia torched tusks three years later. Africa has nearly 500,000 elephants, but the World Wildlife Federation (WWF) says they are increasingly threatened. "We share the view of most experts that illegal or poorly regulated domestic ivory markets in some countries - Thailand, Nigeria and the Democratic Republic of Congo, in particular - are the main drivers of this increased elephant poaching," the WWF says. Commercial trade in ivory has been banned since 1989 under the Convention on International Trade in Endangered Species (Cites).